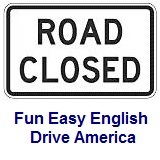 ﻿ Fun Easy English - Drive America - United States of America road signs, rules, and regulations guide, recreational destinations. Recreational and cultural interest area signs for destinations provide information about interesting places to visit in a designated area. Some of these places might be famous national monuments, while others are very small and typically known only to the local residents.